We’ve certainly had a few adventures over the last year as we’ve helped enterprises of all sizes work through elements of their content marketing journeys. One of the biggest insights I’ve had is how many of the content marketers come to success with absolutely no idea when they crossed over from “struggle” to “success.” It’s as if one day they just woke up and realized they’ve been operating in a completely different way and, yeah, it’s working. This is what I mean by that first sentence. You start down this road of reinventing your marketing approach, and every day you’re closer to where you’re going, and further away from where you were. And success doesn’t eliminate the challenge. I will tell you that every successful content marketing example shared in every keynote talk and at every conference has political challenges, silos, measurement issues, and overall budget challenges. This reinvention is, indeed, a road, not a door. It’s not. We have to change. 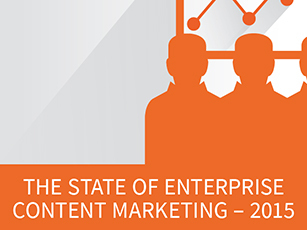 As we did last year, we are honored to present our annual State of Enterprise Content Marketing. Our thinking is greatly informed by the discussion at our Executive Forum in March. But, this is also the culmination of our observations from Content Marketing World 2014 and our consulting and advisory client work over the past year. The extraordinary insights and the identification of challenges could not have been possible without the generous contributions of this forum class, as well as last year’s forum participants. Their input doesn’t represent their tacit endorsement of the ideas, but as a collective group they are responsible for the value contained in this report. Last year, we proclaimed the forecast for content marketing to be “cloudy with a chance for change.” There was a real and palpable struggle to get over the cultural hurdles of starting a content marketing program. Measurability was the biggest issue, and it continues to be an enormous challenge. But in the past year we’ve seen tremendous progress, and the mood seems considerably improved. Making the business case has evolved from “why start” to “how do we effectively scale” content marketing. Companies like Marriott are creating in-house content studios. Blue-chip companies like GE are creating television series and long-form content as part of their brand strategies. Brands like Starbucks are partnering with well-heeled journalists to run content initiatives. Credit-card companies like Capital One are acquiring user-experience and content-creation agencies to make digital customer-experience design an in-house competency. Publishers like The New York Times, The Wall Street Journal, The Guardian, and Condé Nast have launched content-creation agencies to help other brands get good at content. The customer relationship is more complicated than ever. The idea of the customer, conversation, and community is changing. Social media is evolving from an earned media process to a paid media strategy. Owned media is the differentiator, but it seems to have the biggest cultural roadblocks. In many ways, marketing is trying to get out of its own way. The value of content marketing seems obvious – to create customer value through the creation of content-driven experiences. But, the business cannot take its eye off the ball in creating direct, revenue-producing activities. Prioritization conflicts abound. ‘Content shock’ is more buzz than bite. Yes, it’s noisy out there. Publishing and distribution tools now theoretically make anyone a mass publisher. And, yes, in a world where content multiplies exponentially and time remains finite, it’s harder to be remarkable. Yes, a big brand can pay more to rise above the noise, but bigger budgets cannot pay to have more relevance and value to a customer. It is a leveling of the playing field, not a fix in the game. Noise affects everyone equally. So – the brands that get “good at content” and deliver value to a highly focused audience will be the ones to succeed. The opportunity for content is not simply an advertising mandate; this is an everything-the-company-communicates mandate. Simply paying for attention will no longer do. We, as marketers, have to hold that attention long enough so that we matter to customers. The marketing department is more strategic. Businesses tend to look at the advancement of marketing and content with a focus on both hardware and software development. In other words, we look at the development of tablets, mobile phones, or refrigerators with screens as more platforms for which we need to build a team or strategy. Or we see customer-aggregation points, such as broadcast television, cable TV, Facebook, Twitter, LinkedIn, Snapchat, or even Ello as software platforms to which we need to assign specialists who will develop unique content strategies. We must realize that there is no way that we can (or will) scale to every channel. The only way to scale is to adapt the marketing department’s structure and purpose around the creation, management, and ultimate flow of information (i.e., content) to both describe and, more importantly, create value for customers. Marketing doesn’t change content’s purpose. Content changes marketing’s purpose. Yes, the state of content marketing in 2015 is stronger, with a challenging twist of scale. It’s easy to be remarkable once. The trick is being remarkable consistently. As we heard more than once at the Executive Forum, “Success is being driven by acting like a start-up – developing content ‘products.’ ” Sometimes this happens in secrecy and sometimes it’s in the open. What’s clear is that unique, impactful, differentiating, content-driven experiences are becoming as important as product development itself. Successful marketers will adapt and change in a constantly evolving media operation that focuses on creating delightful experiences to inform, entertain, engage, and evolve the customer – that’s the business’ sustainable competitive advantage. As for us at CMI – we feel like it’s time to grow this revolution. We’ve got the fuel. Now it’s time to fire it up and head out. Onward. The road awaits. Calling all CMOs and marketing executives: Join Robert Rose and 40 of your peers at our CMI Executive Forum on March 10-11 in Las Vegas. Leading brand marketers will join together to discuss the state of enterprise marketing. Register today!